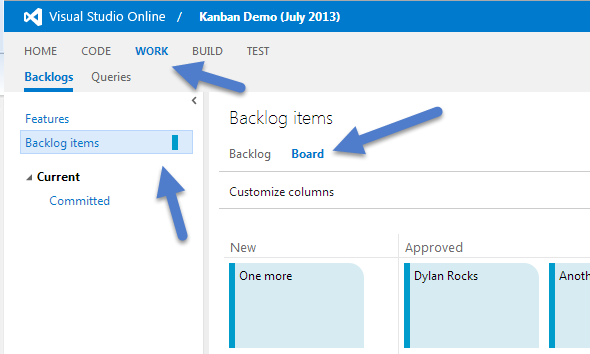 This is part 2 of a series of posts that show how we can model virtual kanban systems on TFS 201x. If you didn’t read part 1, I would recommend that you start there. You cannot access the TFS data warehouse (which we will need to do) using Visual Studio Online and as far as I know, there is no way to access the data stored there in any way yet. 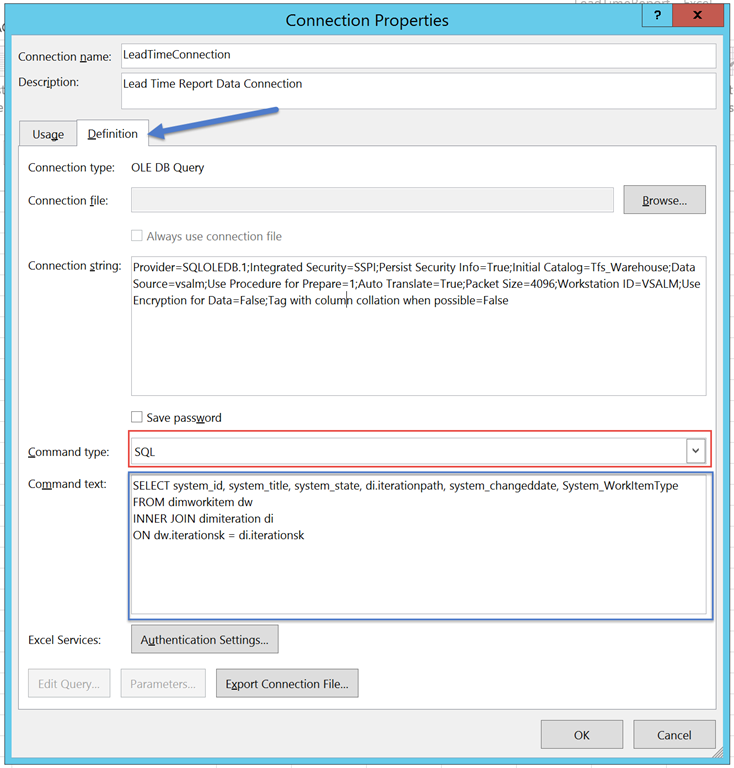 As such, this post will make the assumption that you are using TFS 201x on-premise and can access the TFS Data Warehouse. Same assumptions from part 1 apply and I’ll re-iterate them here along with a few other assumptions. You are a TFS user and will understand the features that I’m using. Just as a quick review, here is the current state of our virtual kanban system implementation. Remember that we are using iteration paths to represent the backlog (uncommitted work) and the kanban system and the only work item state we will be (really) interested in is “Done”. Using the movement of a work item into the kanban system iteration path, until it gets to a “Done” state, we can now calculate the lead time for that item. The easiest way I’ve seen to do these analysis, after your kanban system has been setup and running for a while, is to use Excel to consume and analyze TFS data warehouse data about work item changes. The first thing we need to do is turn on the Developer Ribbon in Excel. 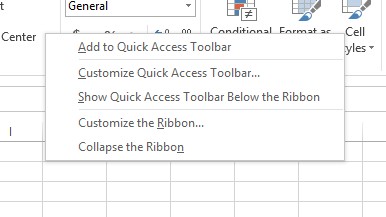 After you’ve started Excel (I’m using 2013), right click on the ribbon and select the Customize the Ribbon option. 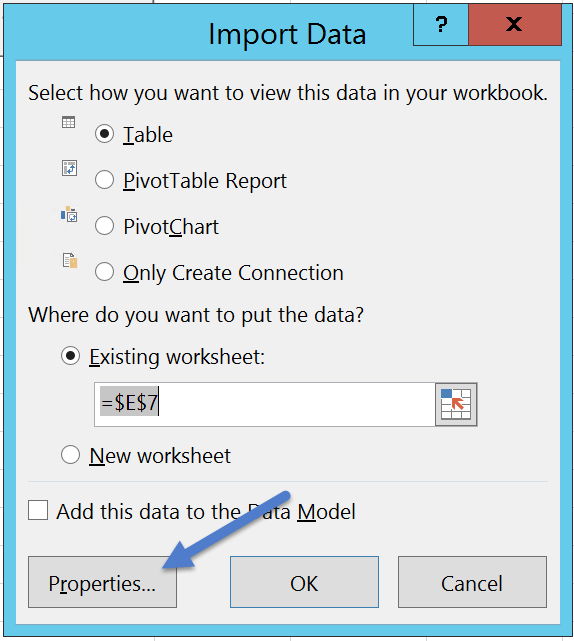 Turn on the Developer tab by checking the box and pressing OK.
For this exercise, I like to create three sheets in my Excel workbook. We will refer to the names of these sheets in our Excel VBA code. Excel has the functionality to connect to easily connect to SQL Server databases and that is exactly where TFS stores all of it’s data. TFS stores the data that we are interested in in a database that is called Tfs_Warehouse. Navigate to the Data tab on your spreadsheet and put the caret on cell A1. 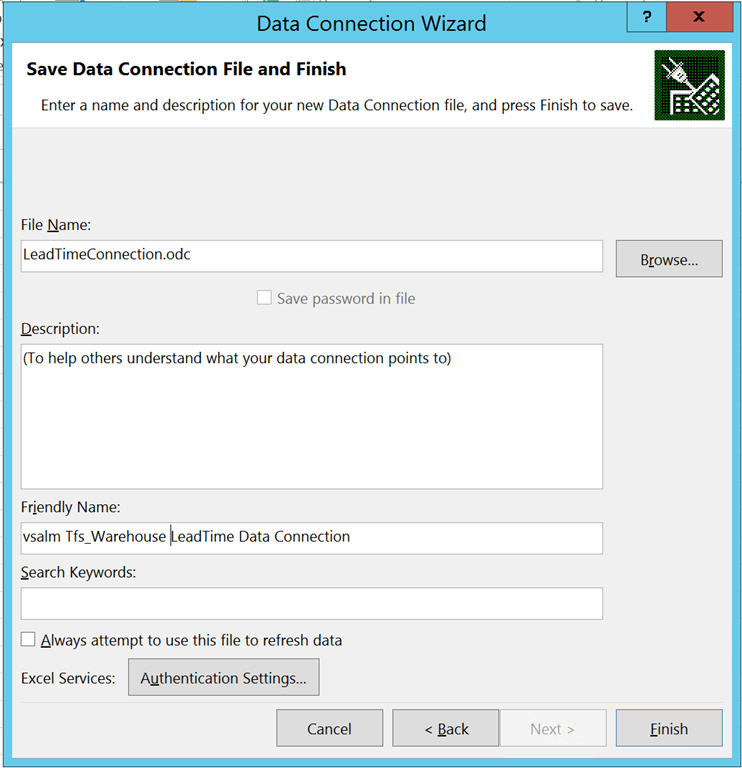 Now create a connection to Tfs_Warehouse by visiting the Data tab, clicking the From Other Sources button and selecting From SQL Server. Enter the name of the database server that is the backend for your TFS installation and use the appropriate credentials (SSO or SQL Server account) in the connection dialog and click Next. Note – You will need to able to access the server with either your domain account permissions or a SQL Server account that has permissions to access Tfs_Warehouse database. 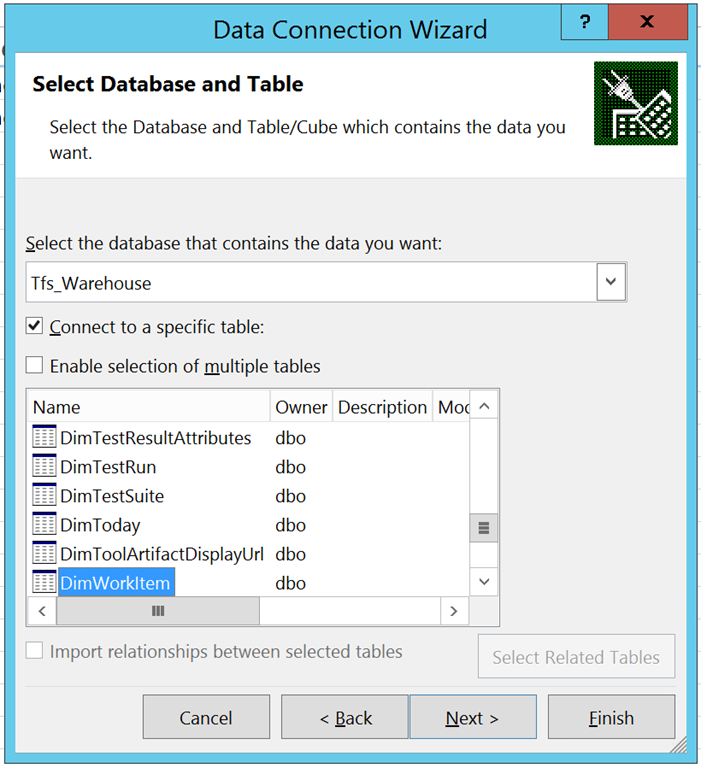 Select the Tfs_Warehouse database on the server and the DimWorkItem table and click Next. Change the name of the connection to something more friendly like LeadTimeConnection.odc and set the friendly name to something more descriptive and click Finish. An Import Dialog will pop open once you have hit Finish. Select the Properties button on this dialog. On the Properties dialog, click the Definition tab and then change the Command Type to SQL and enter the SQL statement below in the Command Text textbox and press OK.
Now press OK on the Import dialog and you should now see the Data sheet fill up with data from your TFS database. Caveat – I’m not a VBA Script writer by trade! I’m fairly certain there could be better ways to write this code, but since writing elegant VBA code is not my objective, I’ll just get you to the lead times. If you have any suggestions on how to better code this out, I’d love to hear from you. 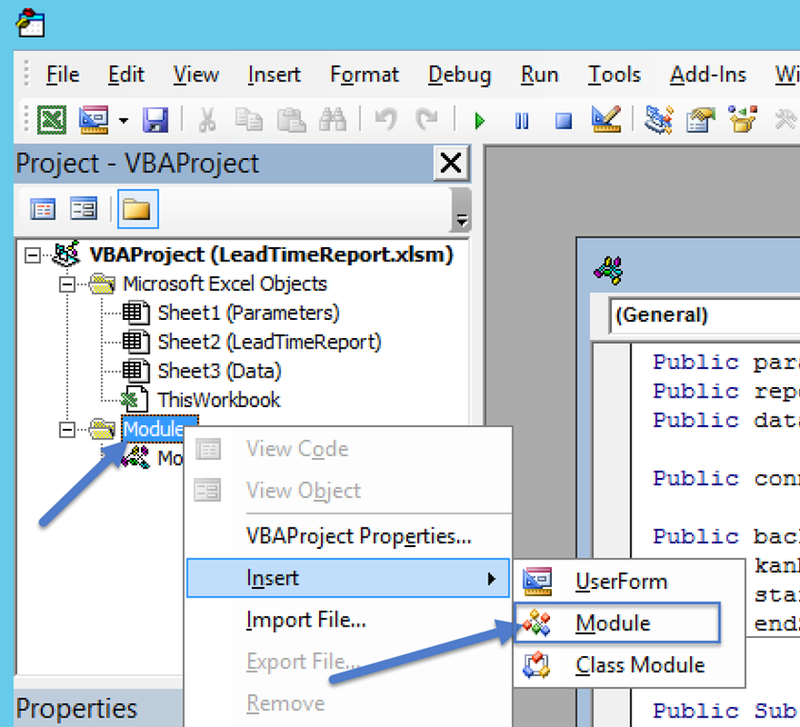 On the Developer tab, click the Visual Basic button to get to the VBA IDE. Once you are in the Visual Basic editor, create a new module for holding your code by right-clicking on the Module node of the tree and inserting a new Module. Now we can just start entering all of the code from below. These strings (global) allow us to do set our sheet names and change the iteration paths that we use to model our kanban system. This code needs to discover the length of the data set that we’re processing. This function does that. This code is pretty messy but isn’t actually very complicated. What happens in this function is that we go through each row of the source data set and look for the work item entering the kanban system iteration path. We then look for the work item getting to the done state. If a Start Date and and End Date are discovered for the work item, we make an entry in the LeadTimeReport sheet with the calculated Lead Time. If we do not find those dates, no entry is made. You can step through the code in the IDE using F8 to step through each line of the function. backlogIterationPath = "\Tailspin Toys\Iteration 1"
kanbanSystemIterationPath = "\Tailspin Toys\Iteration 1"
periodDates = " Where system_changeddate between '" + CStr(startPeriod) + "' and '" + CStr(endPeriod) + "' and System_WorkItemType = 'User Story' Order by system_id , system_changedDate asc"
Now that the module has been created that does all of the data transformation work, we need a simple UI that allows us to pick a Start Date and an End Date for the period under observation and a button to kick the whole thing off. 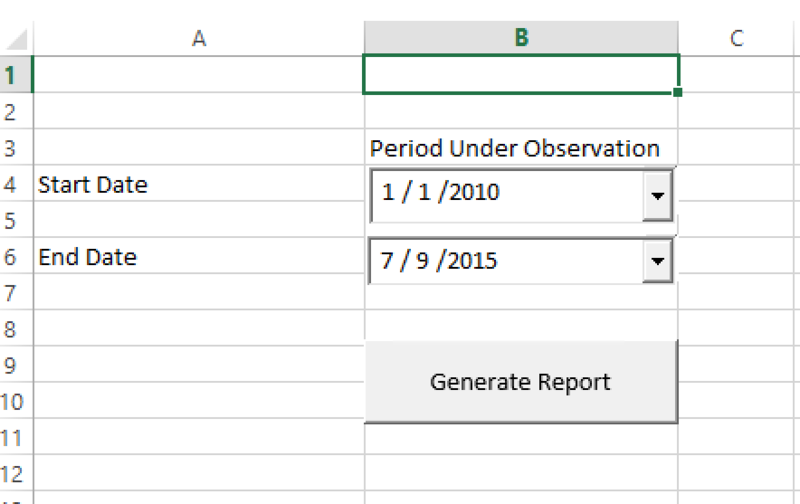 After you have selected the Parameters worksheet, in cell A4 type out “Start Date”. In cell A6 type out “End Date”. And finally on B3 put “Period under Observation”. These are labels for our UI. Now on the Developer tab, click the Design Mode icon on the ribbon. Now we can Insert 2 Date Picker controls onto the worksheet. Click the Insert icon on the ribbon and then click the the very last icon on the bottom right. 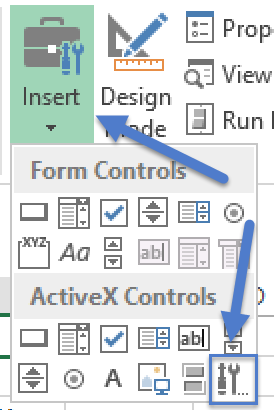 In the More Controls dialog that comes up, select the Microsoft Date and Time Picker Control 6.0 (SP4) and then click OK. You will now be able to “draw” out the new control on the worksheet. Draw out the first control roughly on cell B4. In the Excel Name Box, name the control startDatePicker. Repeat the process for the second date time control and draw the second control roughly out on B6. In the Excel Name Box, name the control endDatePicker. These names are used in the script to find the range parameters. Now we need to add a button. Click the Insert icon again and select the first icon on the top left and draw out a button roughly on cell Here is what it should look like when complete. We should have completed all of the steps required to generate lead time data for the kanban system that we’ve model in Part 1 of this series of blog posts! If you press the buttons and everything has been typed in correctly, you should see data populate the LeadTimeReport worksheet. This will look roughly like this. You can format the first row of the LeadTimeReport sheet however you see fit. If you want to add more rows of labels, you will need to edit the scripts as they start adding lead time entries on row 2. I’d like to point out that in this case, I’m using the Brian Keller ALM VM for Visual Studio 2013.4 and the Fabrikam Team Project inside of that VM for data. You will need to change the script to reflect the iteration paths that you are using your kanban system in TFS. This has been a fairly long and detailed post and I hope that you’ve been able to follow it and get the lead time data generation working in your environment. There are more sophisticated ways of generating this lead time data (programmatically more advanced applications). The reason I wanted to use Excel and Visual Basic was to allow anyone to generate lead time data with the basic tools that are available in a normal IT shop that uses TFS. If you’d like to expand on this approach and develop an application that does this (which I have already done elsewhere), I hope that you can use this example as a guide to what you’ll need to do to write your application. Thanks and I hope to hear from you in the comments soon. Let me know if this worked for you or how I can make this example better. 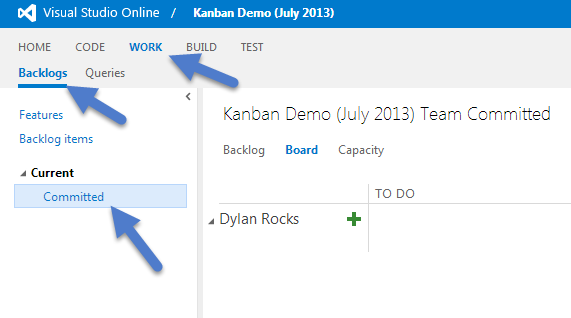 Microsoft has been making some great strides in adding features to Team Foundation Server (TFS) that allow for the modeling of the virtual kanban system that your teams might be using to manage their work. The web access kanban boards and the ability to manage WIP limits on the boards are two such features. Kanban tooling is still relatively new to Microsoft and they are trying to adapt a product/approach that has historically been very well suited to Scrum and Traditional work management techniques, and so it isn’t much of a surprise that we need to tweak the way that we use TFS 201x to help us correctly model our virtual kanban systems. To that end, we need to take advantage of a few of the features in TFS to allow our teams to be more effective when using kanban. This is the first in a series of blog posts detailing how we can model kanban systems on TFS. The first challenge that we’ll encounter when using TFS is that there is no specific kanban process template, which is actually the right approach in my opinion. It would be tremendously difficult to create a one-size-fits-all kanban process template and I think we need to get into the habit of customizing our process templates if we’re going to be using kanban work management techniques. That said, we still need to be able to have an ability to plan in an iteration-less environment. This is where we get a bit confusing with the features we use in TFS vs. our intent, but it will work for us. TFS uses the Iteration Path structure to determine what is on the Product Backlog board in web access. The Product Backlog board is the current feature in TFS to visualize our kanban system so we would like it to represent things in a more traditional kanban way. In order to do this, we need to modify the Iteration Path structure and communicate with our team how it is intended to be used. This means that we need to communicate that we are using the TFS feature named Iteration Path for something other than an iteration as it would be commonly understood if we were using a Scrum work management approach. Here we find a model of a simple kanban system. We have an uncommitted backlog of options or ideas that we may or may not eventually work on. We have a Ready Queue which is the work we have committed to doing next, we have a Doing column that represents the actual development work and a Done column that represents that we have finished some piece of work. One of the primary reasons that we need to doing all of this is so that we can calculate a lead time for our work items, which TFS 201x currently does not do for us and the way that the kanban boards are currently implemented, we cannot access the data that is captured by the kanban boards. (Product Group call out here: We want access to that data!) Lead-time is a basic and fundamental metric for measuring the performance of work through a kanban system and so we kind of need to be able to generate that information. When you want to capture lead time data for work items, we need to identify the start and finish line for the work. Done is fairly universally recognized as the finish line, but the start line is a little harder to define sometimes. 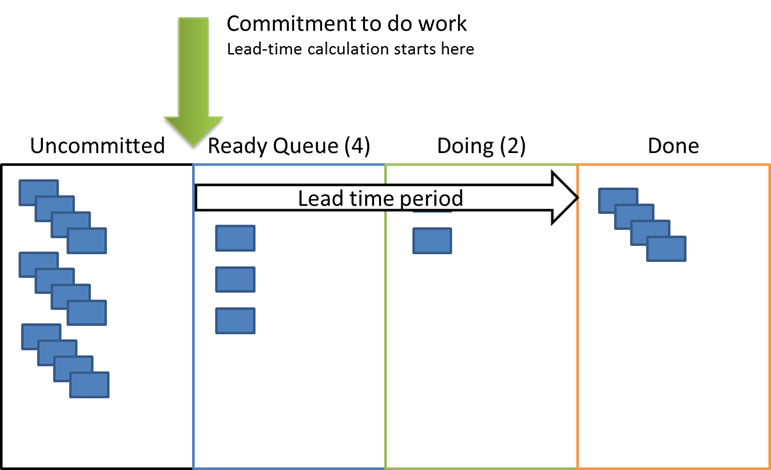 In this kanban system example, we are going to state that Uncommitted work is not a part of the lead time calculation but when we move work into the Ready Queue for the team to pull from next, the lead time period has been determined to have started. One of the current challenges with TFS is that lead-time is perceived to have started when a card appears on the board and the cards appear on the board as soon as it is placed into the Product Backlog iteration. 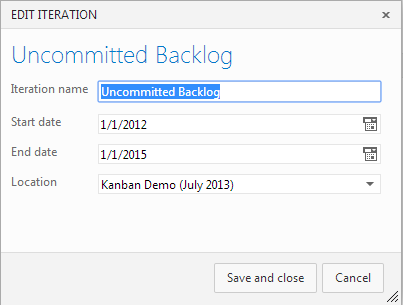 Another challenge is that all work items (uncommitted or committed) may appear on the kanban boards if the work item is placed in the Iteration Path that has been identified as the Product Backlog in TFS. To this end, with this simple workflow, we are going to use the Iteration Path feature and create an Uncommitted backlog and a Kanban System ‘backlog’. One of the great aspects of TFS is the ease with which you can create or modify Iteration Paths. 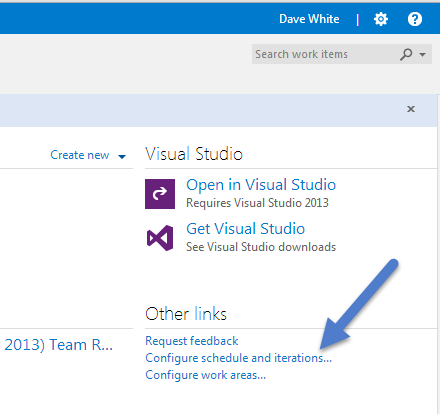 I’m going to be using Visual Studio Online for demonstration purposes. The Visual Studio Online web interface is the same as the on-premise Team Foundation Server web access interface, so if you have TFS on-premise, you can follow along just the same. First, we need to go configure our Iteration Path structure. Once you have arrived at your Team Project page on Web Access, you can find the link to make those modifications on the right-hand side of the page. For simplicity sake, I’ve hidden a couple iteration paths in the Released branch. For now, let’s look at the root node of our Iteration Path structure. Remember that the Iteration Path work item field is a hierarchical data type. Let’s create an Uncommitted iteration path. Go a head and select the root node in your environment and create a path called “Uncommitted Backlog”. Make sure you are on the root node of your Iteration Path. In our situation, the dates don’t mean anything to us, but TFS 2013 presents the iterations in this screen ordered by Start Date so we’ll use the dates to “order” our Iteration Paths visually. Note – In drop-downs on the work items and in Excel, the Iteration Path values will be ordered alphabetically. Now let’s create our Kanban System Iteration Path. It should also be a child of the root node and the start date should be 1/2/2012 or one day after the uncommitted backlog’s start date if you chose a different date than I did. You’re Iteration Path structure should now look like the image above. There is one more Iteration Path node that we need to create in order for the Web Access Task board to work correctly as well. 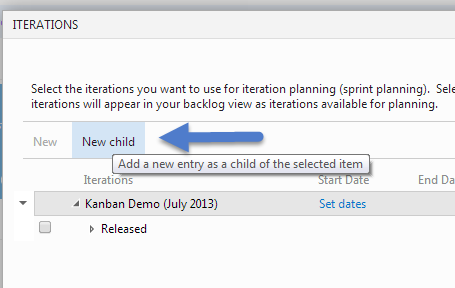 On the Kanban System node, create a new child called “Committed”. Awesome! We have now created an Iteration Path structure that models our virtual kanban system. Now there are two more things that we need to do on the Iterations management screen and that is hook up the two boards we’ll be using in web access to the correct Iteration Path nodes. 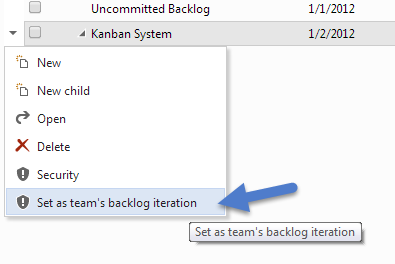 First, you need to right-click on the Kanban System node and select the Set as team’s backlog iteration option. This connects the Kanban System node to the Backlog Kanban board. Next, click the check-box on the Committed node. This connects the Committed node to the Task Board in web access. You might be asking yourself why we have to have the Committed node under the Kanban System node. Well, give it a try if you’d like, but currently, the team’s backlog iteration cannot be the checked iteration that will be shown as the task board. Now that we have our kanban system model and a Iteration Path structure that represents that system, we can show how they are intended to map together. Because the current crop of TFS process templates don’t naturally support modeling virtual kanban systems, we are able to use process template agnostic features of TFS to model our kanban system. So why are we doing all of this you ask? There are several advantages to this particular approach that I like. You can use this technique with any process template that uses the TFS Iteration Path work item field. 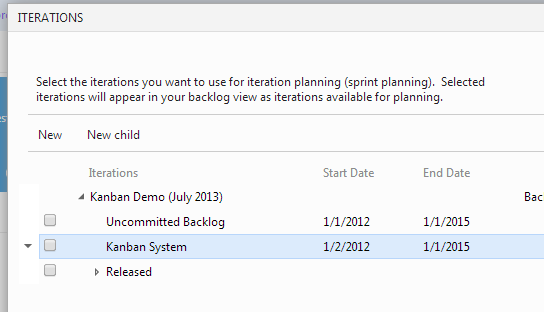 Currently, most teams will try (want) to use the kanban board columns but because the data is not accessible, we can’t. Other teams will model their kanban system with Work Item States, but this tends to become a mess as Work Item Template modifications need to be done on a lot of work items and frequently. This is just a PITA, especially if you don’t have TFS administration skills in-house and rely on consultants to help with process template modifications.By using membership in an Iteration Path as the means to determine when something has entered (and/or left) a lead time boundary, we free ourselves from having to use work item states as a means of creating these lead time boundaries. One of the things we want is concise, useful queues (and queue visualizations) in any tool, including Excel, Visual Studio or the web access. Currently, web access will limit the # of work items it presents in the queues, but users of Excel or Team Explorer will get potentially long and confusing lists of things to review. While our Uncommitted queue may be (and usually is) quite long, the daily working queues and the kanban system can be made smaller and more concise. This aids planning and decision making about what to prioritize and pull daily. This technique will work on TFS 2010. We won’t get the nice web access boards, but as we’ll see in follow-up posts in this series, there is still value in using this technique to capture lead time for work items. Cycle time is the time between two arbitrary states in your kanban system. 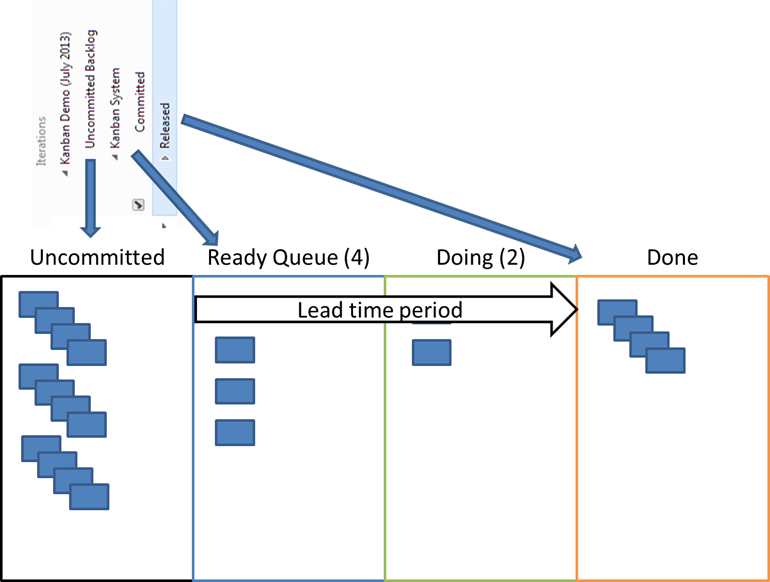 Using our example kanban system, I would say that cycle time of the Doing column might be 2 days, but the lead time of the entire system is 4 days. I don’t think that I would encourage my teams to use this Iteration Path technique to model individual columns. I don’t think that this technique is natural to the VS community at large. I think it works and is a novel way of modeling kanban on TFS, but there needs to be education about how the team (and upstream and downstream partners) are using TFS. Hopefully this have given you some ideas on how to better model virtual kanban systems in TFS. Virtual kanban systems are a tremendously valuable means to manage work, and even though TFS doesn’t currently support them in a intuitive manner, we can still use many of the features in TFS to achieve our goals. You could also use these techniques in similar fashion in non-kanban environments, if you simply want to clean up or better manager your queues. In the next part of this series, I will show how we take advantage of this technique to calculate lead-times from your work item data. As always, I would love to hear your thoughts or answer your questions.